If you have ever walked across the Golden Gate bridge, flown a kite along the waterfront in Tiburon, in-line skated on the Foster City levee, hiked through the San Francisco Bay National Wildlife Refuge, or windsurfed off Candlestick Point, you too have enjoyed the Bay Trail. 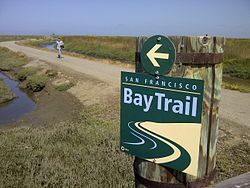 The Bay Trail is a planned recreational corridor that, when complete, will encircle San Francisco and San Pablo Bays with a continuous 500-mile network of bicycling and hiking trails. It will connect the shoreline of all nine Bay Area counties, link 47 cities, and cross the major toll bridges in the region. To date, approximately 310 miles of the alignment—over 60 percent of the Bay Trail’s ultimate length—have been completed. The Bay Trail provides easily accessible recreational opportunities for outdoor enthusiasts, including hikers, joggers, bicyclists and skaters. It also offers a setting for wildlife viewing and environmental education, and it increases public respect and appreciation for the Bay. It also has important transportation benefits, providing a commute alternative for cyclists, and connecting to numerous public transportation facilities (including ferry terminals, light-rail lines, bus stops and Caltrain, Amtrak, and BART stations); also, the Bay Trail will eventually cross all the major toll bridges in the Bay Area. Today, you can access the trail maps online or with your smart phone. Click here and start your hiking adventure of the San Francisco Bay. For more information visit San Francisco Bay Trail.